A unique line-up of professional skateboarders, community leaders and renowned scholars from a wide variety of disciplines will be joining forces for the first time to examine the unconventional role of skateboarding in fields as diverse as urban planning policy, humanitarian aid, and gender identity. 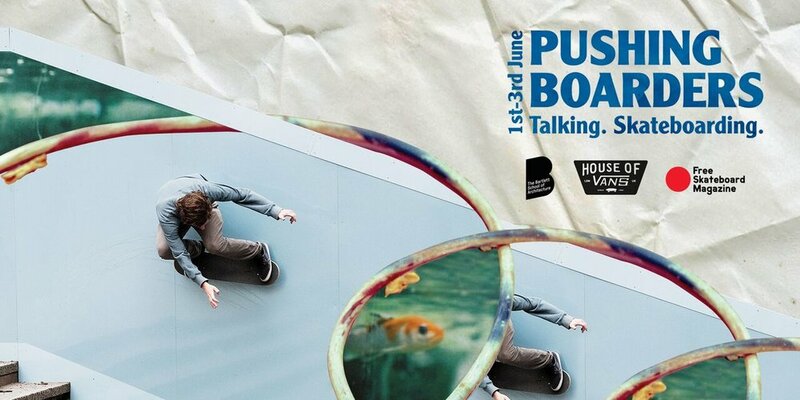 PUSHING BOARDERS is a collaboration between London based non-profit groups SkatePal, Re-verb Skateboarding, and Long Live Southbank – the organisation behind the successful campaign which saved the ‘Undercroft’ skate spot on London’s South Bank from redevelopment. The event, which is a celebration of the social and cultural impact of skateboarding, will take place at the House of Vans London and The Bartlett School of Architecture, UCL from June 1st-3rd. Highlights of the event include ‘Globally Stoked’ – a photography exhibition featuring images of emerging skate scenes from Peru to Palestine; ‘Skateboarding is Not a Crime: How to Build a Skate-friendly City’ – a debate between city officials and public space advocates; a discussion on experiences of race and identity within skate culture led by University of Southern California professor Neftalie Williams; and ‘The Rise of Female Skateboarders’ discussing how urban spaces, predominantly designed by men, affect and interact with female skaters. Some of the iggest names in skateboarding and academia will travel to London to be part of the panel discussions over the course of the weekend, including: lissa Steamer, the first woman to become a professional skateboarder; MIT-trained architect and pro-skater Alexis Sablone; UK pro-skater Lucy Adams; Skateboarding Coordinator for the City of Malmö Gustav Svanborg Eden; Founder of Skateistan Oliver Percovich; pro-skater and children’s book author Karl Watson; and art historian and satirical skateboarding critic Ted Barrow. The weekend kicks off on Friday 1st June with the opening party at House of Vans featuring DJs and a skate film premiere. Talks take place over the Saturday and Sunday, with a free skate school, a street market and Drop-in ‘PhD surgery’ for anyone interested in writing their university thesis about skateboarding. The weekend concludes with a skate session at the legendary Southbank Undercroft.